CAMEX Flight Tracks Click on an image to view it at full size. 09/24/2001 010418 DC-8 Nav. Data for flight #010418 on 9/24/2001 into Hurricane Humberto. 09/23/2001 010417 DC-8 Nav. Data from flight #010417 on 9/23/2001 into Hurricane Humberto. 09/22/2001 010416 Nav. 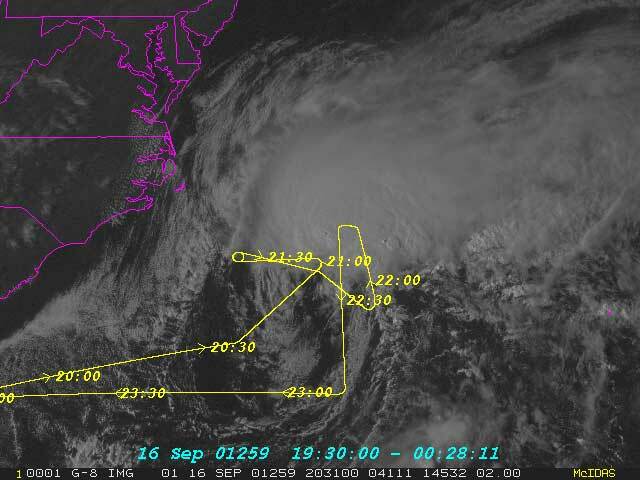 Data for DC-8 flight #010416 for 9/22/01 into Tropical Storm Humberto. 09/19/2001 010415 Nav. Data for flight #010415 (KAMP flight) over and near the Florida Keys and Florida Bay on 9/19/2001. 09/15/2001 010414 Nav. 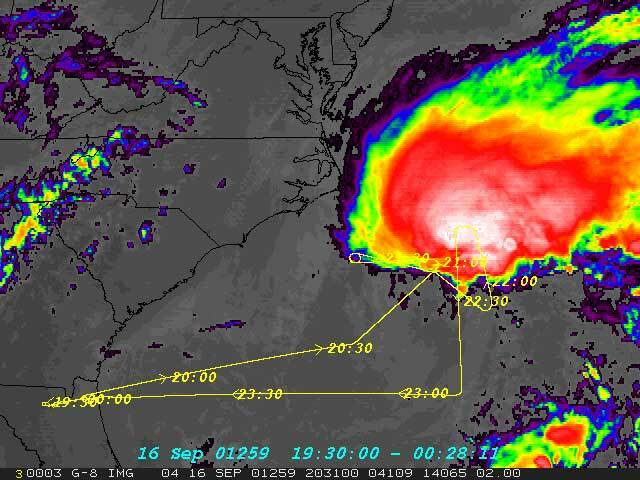 Data for flight #010414 on 9/15/2001 into Tropical Storm Gabrielle. 09/10/2001 010413 DC-8 Nav. Data for flight #010413 on 9/10/2001 for Optimal Data Assimilation Mission around Hurricane Erin. 09/09/2001 010412 DC-8 Nav. Data for flight #010412 on 9/9/2001 over Florida Bay in stratiform precipitation. Includes spiral descent and 3 overpasses of KAMP MIPS site. 09/07/2001 010411 DC-8 Nav. Data (010411) for flight of stratiform precip over the Gulf. Includes DC-8 spiral. 09/06/2001 010410 DC-8 Navigation Data for flight #040410 (9/6/01) for flight over East Coast of FL and GA. TRMM overpass at 1844 UTC. 09/03/2001 010409 DC-8 Nav. Data for flight #010409. KAMP flight over Gulf Storms and overflight of MIPS site on Big Torch Key. 08/25/2001 010408 Flight over buoys east of Cape Canaveral. 09/24/2001 01-142 ER-2 Nav. Data for flight #01-142 on 9/24/2001 over Hurricane Humberto. 09/23/2001 01-141 ER-2 Nav. Data for flight #01-141 on 9/23/2001 over Hurricane Humberto. 09/22/2001 01-140 ER-2 Nav. Data for flight #01-140 on 9/22/2001 over Tropical Storm Humberto. 09/19/2001 01-139 ER-2 Nav. Data of flight #01-139 on 9/19/2001 for KAMP over and near the Florida Keys and Florida Bay. 09/16/2001 01-138 ER-2 Nav. 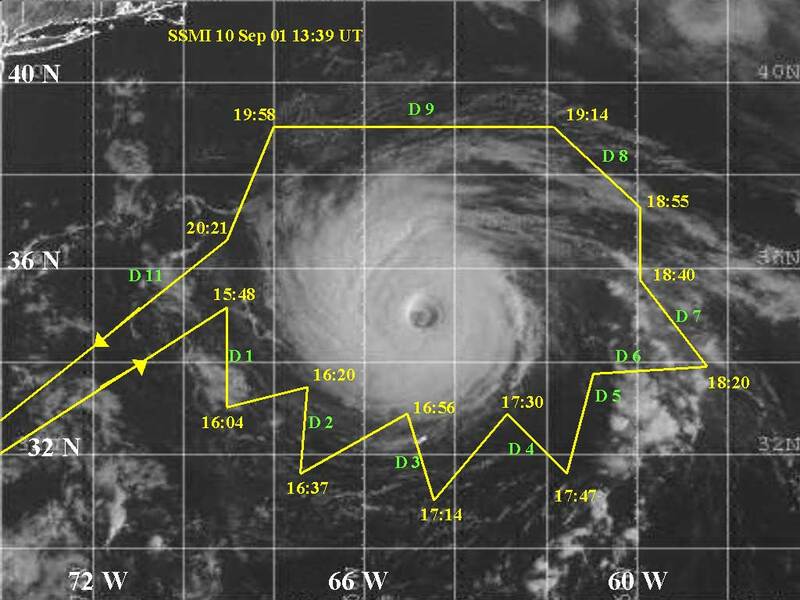 Data from flight #01-138 on 9/16/2001 over Hurricane Gabrielle. 09/10/2001 01-137 ER-2 Nav. Data for flight # 01-137 over Hurricane Erin on 9/10/2001. 09/09/2001 01-136 ER-2 Nav. Data for for flight #01-136 on 9/10/2001 for KAMP flight over FL Bay area. 09/07/2001 01-135 ER-2 Nav. Data for flight 01-135 for stratiform precipitation over Gulf of Mexico. 09/03/2001 01-134 ER-2 Navigation Data for flight #01-134 on 9/3/2001 over storms over Gulf and overpass of MIPS site. 08/26/2001 01-133 Flight over buoys east of Cape Canaveral. 08/20/2001 01-132 ER-2 Nav. 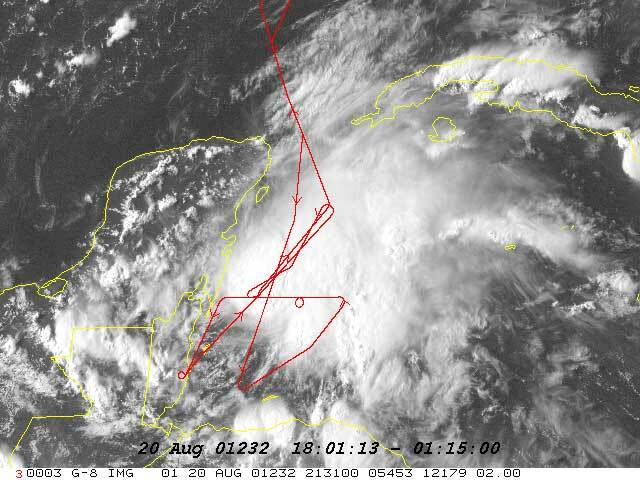 for Sortie # 01-132 over Tropical Storm Chantal. 08/18/2001 01-131 ER-2 Nav. Data for sortie # 01-131 for Overflight of Andros Is. and Key West.